All Atlantic City Casinos are also hotels. This section provides information on hotels that are not associated with casinos. To find out about accommodations at the casinos, visit our casinos page, and follow the links to the individual casinos. 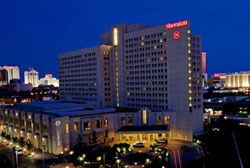 The Sheraton was recently chosen as "The best non-casino hotel in Atlantic City" by the Press of Atlantic City newspaper. The new 800-room "Water Club" tower opened in June of 2008, at the Borgata. The Borgata Water Club has 5 pools and a "Spa in the Sky". The Water Club is a hotel and not a casino, however it is adjacent to the Borgata Casino. The Water Club features signature in-room dining by Manhattan Chef, Geoffrey Zakarian, and shopping at six exclusive boutiques. The Water Club has rooms and suites with five tiers of accommodations. The Borgata Water Club is located at One Borgata Way in the Marina District. Phone: 1-800-800-8817. 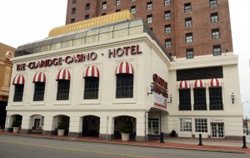 As of May 2014 the Claridge Hotel 0pened under new management as a Hotel Property- Non-Casino. The Claridge Hotel has 500 guests rooms and sits oceanfront to the Atlantic Ocean on the Atlantic City Boardwalk. Included in the inventory are ocean front double and king rooms and Jacuzzi suites. The Claridge is a Radisson Hotel. The Claridge Hotel is right next to the Bally's Casino. Follow this link to see more about Claridge Hotel. 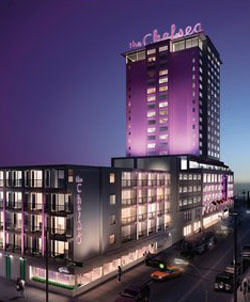 The "non-gaming" hotel, the Chelsea, is located adjacent to the Tropicana Casino in Atlantic City. It was built on the grounds of the Holiday Inn and Howard Johnson motels that had been at that location. 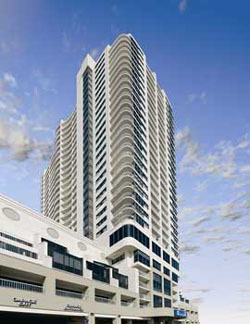 The new Chelsea has 330 rooms and 12 suites, with both ocean and bay views. The hotel has a 15,000 square-foot rooftop swimming pool area with private cabanas, and a 6,500 square-foot luxury spa, that includes the Terrace Lounge - with a bar and game room. Address:111 South Chelsea Ave., Atlantic City. 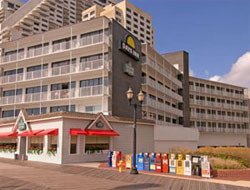 The new, recently opened (Summer 2008), Marriott Courtyard Hotel is one block from the ocean and the historic Atlantic City Boardwalk. The hotel has 206 spacious, comfortable rooms and suites. Parking is free. All rooms have a flat panel high definition TV, and provide high speed internet access. The Best Western Envoy is one block from the boardwalk, and within walking distance to shopping, and many local casinos including: Trump Plaza, Caesar's, and the Trump Taj Mahal. All rooms have satellite TV and high-speed internet access. The Wyndham is one block from the boardwalk and beach. It has 33 stories and 296 rooms, most with outstanding views. The hotel has a swimming pool and a luxurious Spa. 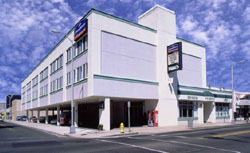 The Howard Johnson Inn is one block from the boardwalk and beach, and next to the Tropicana Casino. 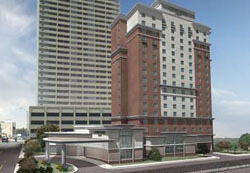 It is two blocks from the Atlantic City Hilton Casino. The hotel has a swimming pool, a fitness center, and high-speed internet access. Days Inn Boardwalk is on the Boardwalk at Morris Avenue. It is the only non-casino hotel on the boardwalk. Most rooms have beautiful views of the boardwalk, beach and Atlantic Ocean. The hotel is in walking distance of most casinos, and the Atlantic City Convention Center. This high-end hotel consists entirely of suites, with fully equipped kitchenettes and spacious seating in every room. It includes a pool, jacuuzi, game room, fitness facility and complimentary indoor parking. The hotel has an outstanding location, right in the middle of the boardwalk, and within walking distance of almost everything. Address: New York Avenue and the Boardwalk. 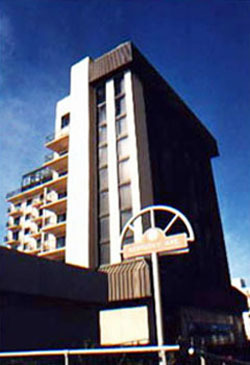 The La Renaissance is an all suites hotel at a great location on the boardwalk. It has large suites that can accommodate up to six people. These large suites have a full kitchen, living room and dining area. Each suite also features a jacuzzi tub. The hotel has a glass enclosed rooftop pool and free indoor parking. Address: 190 South Kentucky Avenue. 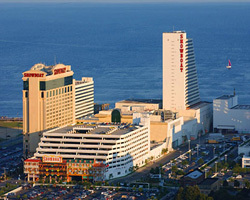 The Showboat Atlantic City Hotel is located at New Jersey Avenue and the Boardwalk. This location provides outstanding views of the beach and the Atlantic Ocean. In September 2014, The Showboat Casino closed. On July 8th, 2016 the Showboat reopened as a hotel only. It has 872 rooms, including 65 oceanfront suites. 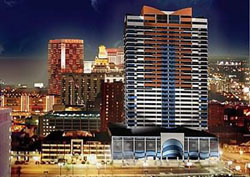 Follow this link to find out more about the: Showboat Hotel.